Photographer Keith Ellenbogen, a regular Aquarium blog contributor, is on the expedition capturing stunning underwater photos of marine life as well as the essence of life on a working research vessel. 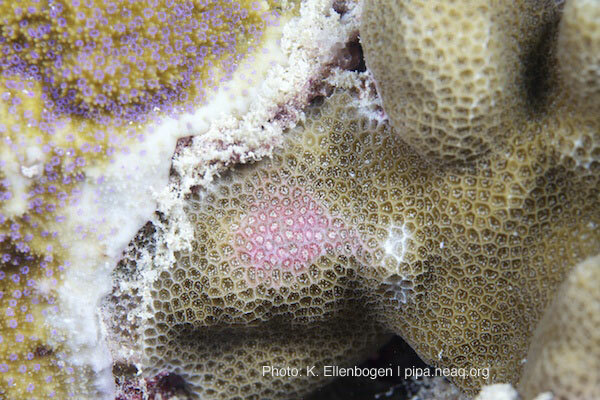 Here are some of the damaged corals he photographed during dives around the Phoenix Islands. In the last post, we explored some of the complexity, diversity, and beauty of corals. Here, Keith demonstrates what corals look like when they are stressed. The Phoenix Islands harbor some of the healthiest coral reefs due to their remoteness and lack of regular human influence. But even here, corals can show signs of stress. The question (which remains to be answered) is how much stress and mortality is "natural" in a healthy reef community? And, what are the driving factors? 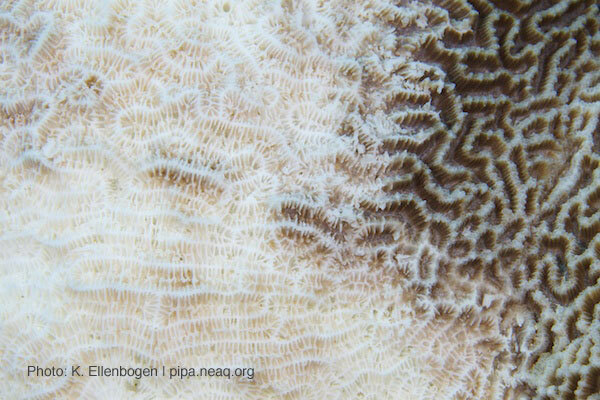 We know that some natural factors that lead to coral stress or mortality include coral-coral competition, predation by other reef organisms, abrasion by other reef organisms, shading by macroalgae, and infection by disease. On the 2009 PIPA expedition, the number of diseased corals found on transects equaled zero. But stressed corals were still observed, and there was evidence of mass mortality from the 2002-03 bleaching event (though recovery was well underway). 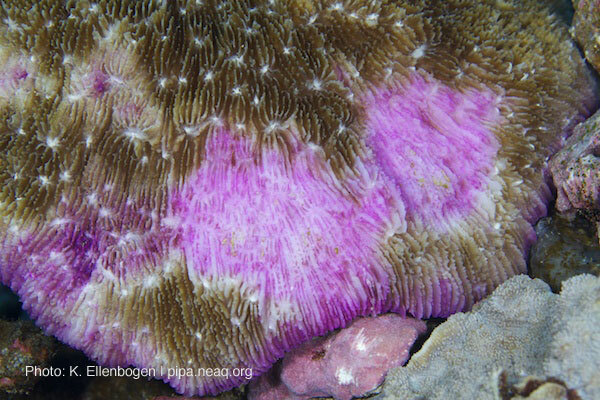 Now in 2012, corals are still recovering and looking fairly healthy, but there are still a few examples of stressed corals. What does stress look like, and what causes it? Below are some examples and guesses. A partially dead (left) and partially alive (right) coral - showing the transition between dead skeleton and living tissue. Cause of death unknown, but the lack of grazing scars, obvious bleached tissue, or other disturbance suggests disease, although no sign of a disease margin is present. Without more information, this one will remain a mystery! The purple scars are the signs of stress; brown areas show healthy tissue. Purple at the colony margins is symptomatic of growth (not yet populated with symbionts), but the central purple lesions could be due to grazing, sedimentation, shading, disease, or other stressors. Lots of healthy tissue means that this coral has a decent chance of recovery. Once a coral (or anything on a reef) dies, it is rarely left to decompose on it's own. Empty space is almost always colonized! 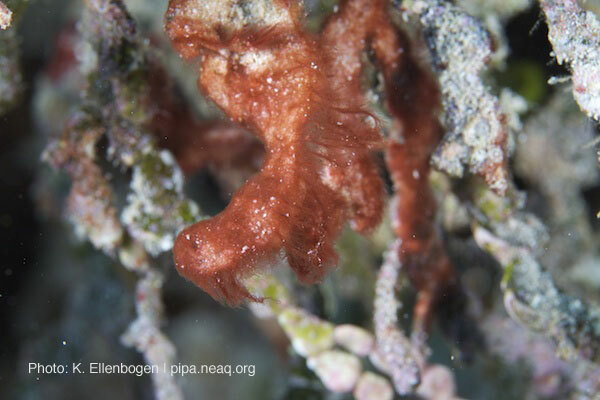 In this case, filamentous algae, sediment, epibionts, and bacterial mats are covering some dead structure (not sure, but this looks like dead Halimeda algae; Halimeda is a hard calcaerous algae that is common on healthy reefs).